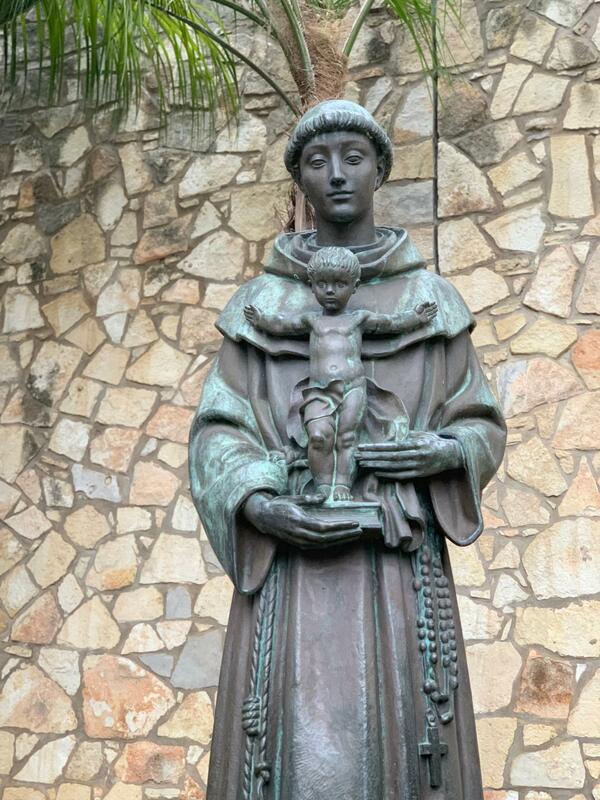 San Antonio, Texas was named after Saint Anthony of Padua, the patron saint of miracles. 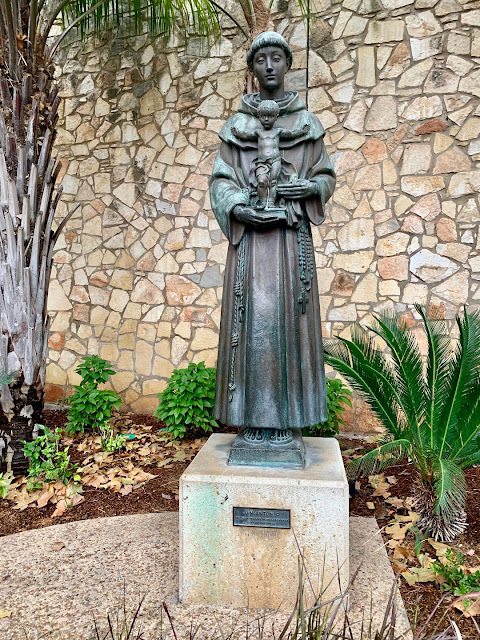 This seven-foot bronze statue, located on the River Walk, was made by Portuguese sculptor Leopoldo de Almeida and was a gift to the city of San Antonio from the country of Portugal. It was presented during the 1968 HemisFair when the Portugal Pavillion opened. According to a 2015 article in the San Antonio Express-News, "Born Fernando Martins in Lisbon, Portugal, on Aug. 15, 1195, Anthony left his wealthy family life to immerse himself in theological study at the Monastery of Santa Cruz in Coimbra, Portugal. A subsequent meeting with friars in Coimbra drew him deeper into the mendicant evangelical life, as he joined that new Franciscan order and adopted the name Anthony. Anthony died on June 13, 1231, in Padua, Italy. He was canonized May 30, 1232, the second-fastest canonized saint after St. Peter of Verona. Centuries later in 1691, Franciscan chaplain Father Damian Massanet bestowed the name San Antonio de Padua on the Yanaguana River on June 13, the feast day of Saint Anthony. The river ran alongside a Payaya Indian settlement, which Massanet came upon while part of an expedition led by Domingo Teran de los Rios, the first governor of Spanish Texas. The river and subsequent Spanish mission built near it would become the heart of a settlement that has since flourished into what is now the seventh largest city in the nation. Hence it’s only fitting that a life-size statue of Saint Anthony overlook the banks of the River Walk, the Christ child standing in its arms as if blessing those very waters so connected to San Antonio’s past, present and future. “San Antonio of Texas is a symbol of human resourcefulness and man’s belief in taming what was considered to be untamable,” said Portugal ambassador Vasco Vieira Garin in a 1968 address at HemisFair, a presentation that officially opened the Portuguese pavilion and gave the city that very statue from Portugal. 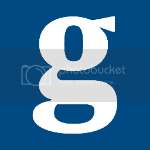 Garin called that time an age of despair, hate and unprecedented rivalry between men and nations. He lauded Anthony as “a legend in his own time,” one with a unifying approach to faith and family whose preaching had a profound impact on people from creeds other than Catholic."